Your leather car seats are an investment. But everyone knows that leather can be hard to take care of. What’s the best product to use, and will it damage your leather? In this article, we’ll walk you through a handful of the best leather products for your leather car seat, including cleaners and conditioners. By the time you’re finished reading, you’ll be ready to take good care of your car seats so that their leather will last a long time. You’ll also pick up a few useful tips on how to take care of your other leathers, too. How Often Should I Clean And Condition My Leathers? Which Hazards Threaten My Car Leathers The Most? How Do I Avoid Damaging My Car Seat Leather? First, you will need to find a leather car seat cleaner which is easy enough for you to use as needed. This means that if you think a cleaning system is too complex to reliably make it to your leathers, you need to find a simpler one. Being consistent with your cleaning habits is necessary because your leathers are consistently exposed to the same hazards. So, opt for ease of use with your cleaning and conditioning system. For some people, this may mean getting a combined cleaner and conditioner product rather than a pairing of other products. Second, you’ll need to pick a cleaner which isn’t overly harsh on your leathers. Typically, the cleaners which advertise a deeper clean are harsher. Deep cleans are necessary sometimes, but remember that the better they clean the leather’s lower layers the more they dehydrate the leather. The more frequently you plan on cleaning your leathers, the less harsh of a cleaning solution you should use. Using a harsh cleaning solution all of the time will damage your leathers quickly. Next, your leather cleaner and conditioner will need to have acceptable scents. If you are turned off by a scent, you will have to live with it in your car for a long time once it seeps into the leathers. You can find scentless cleaners if you prefer. Many conditioners have a buttery or honey-like scent. These scents are meant to reflect the natural scent of the leather and accentuate it, but you often pay a bit extra as a result. If you want to get the high-end leather experience, it’s worth investing in these scented cleaners. Finally, you’ll need to ensure that your conditioner is applying a treatment to the leather that does more than merely rehydrating it. Simply rehydrating your leathers is necessary for their health, but it isn’t enough. Products which rehydrate while also applying a sealant coat to protect against ultraviolet light will be the most useful. You won’t need to apply them as often — a major bonus — and your leathers won’t incur as much passive stress from being in the sun. 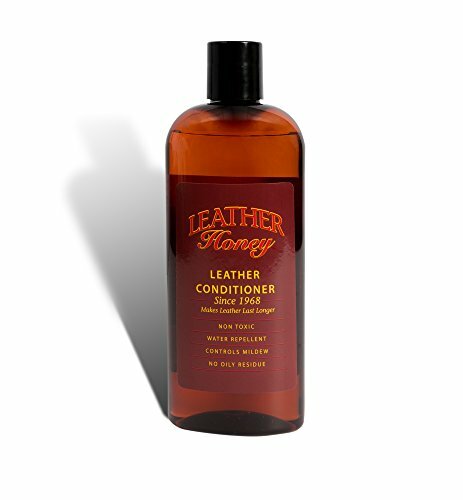 The Leather Honey Leather Conditioner is a great way to spoil your car’s leather, but you’ll need to be careful while applying it or else you may end up with greasy leather car seats. The Leather Honey brand has a long history in the leather car seat space. For over 50 years, the Leather Honey car seat conditioner has been the standby for all manner of luxury vehicles which utilize leather seats. When you use Leather Honey, you’ll be retooling the leather and reinvigorating it for future use. You will need to be cautious with your application of the Leather Honey, however. Like many leather conditioners, Leather Honey penetrates into the leather. Unlike other leather conditioners, Leather Honey is extremely viscous and rich. This means that you won’t need to use very much at all to fully saturate your leathers. If you over-saturate your leathers, there will be seepage. The seepage will dry eventually, and it won’t hurt the leather. It will, however, make your leather car seats a mess to sit on. There’s no guarantee that your trousers will weather the Leather Honey as well as the seats do. So long as you are cautious with your application of the Leather Honey, it’s a great way of preserving your car’s leather seats. 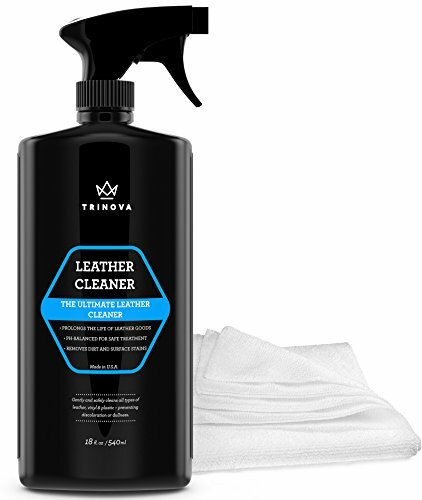 The Leather Nova Cleaner for Couch, Car Interior, Bags, Jackets, and Saddles is an easy to use leather cleaner which you can spray on as frequently as you would like for effective leather cleaning sessions. As a spray-on leather cleaner, the Leather Nova is very easy to apply. Unlike other spray-on leather cleaners, the Leather Nova is also very effective at preventing any buildup of grime or mildew on your car’s leathers. There isn’t much potential to damage your leather with the Leather Nova. The cleaning detergent is very gentle in comparison to many more serious leather disinfectants. Nonetheless, the Leather Nova can dry out your leathers a little bit, so you should make sure to condition your leathers afterward. As a bonus, you can use the Leather Nova to clean vinyl, faux leather, and durablend. 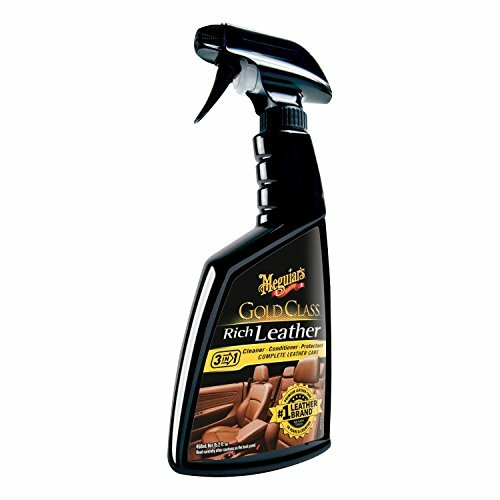 Anything that is similar to leather in texture will get a good cleaning from this product. 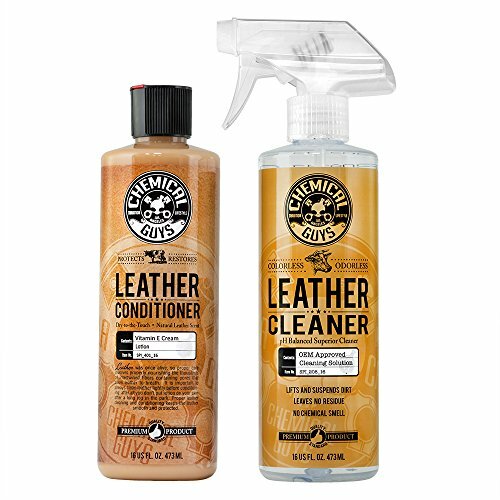 The Chemical Guys Leather Cleaner and Conditioner Complete Leather Care Kit is a powerful leather cleaning and protection system which is powerful and comprehensive for your car seats. The Chemical Guys have mastered the art of making cleaning leather car seats safe and easy by pairing together the necessary components into a single kit. In the kit, you’ll find a leather conditioner and also a gentle leather cleaning solution. The cleaning solution is very light and foamy, which makes it easy to apply and get into every nook or cranny. The cleaner is very safe for your leather, and you won’t need to worry about applying too much. All of the cleaner product wipes away very easily, and it won’t even dry your leather out very much. After finishing up with the cleaning solution, you follow up with the conditioner. The conditioner is a bit harder to use than the cleaning solution, but thanks to the kit’s instructions that are printed on the bottle, you shouldn’t worry. Rub in some of the conditioner, and you’ll be doing your leather a favor. Fibers won’t degrade as quickly with the help of the conditioner’s nourishment. The Weiman Leather Wipes are the simplest and safest way of cleaning your leather car seats, but they may not be as effective as other cleaners. 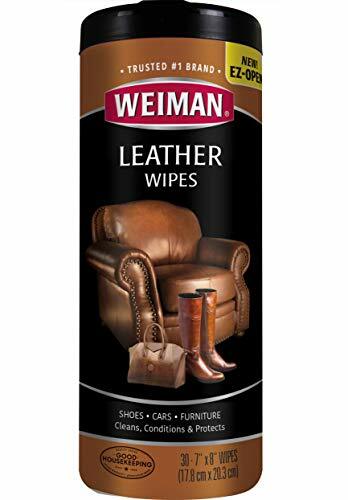 Grab one of the Weiman Leather Wipes, swab down your leathers until it’s dry, then repeat the next time your car seats are dirty. The wipes are the simplest possible leather care routine that will still take some of the grime away from your car seats. Because of how simple they are, there is also a very limited ability to use the wipes incorrectly. Even with egregious wiping beyond what is necessary, the wipes don’t impart enough liquid onto the leather to cause any damage. The consequences of such a safe clean are that you won’t get a very deep clean out of these wipes. Likewise, the amount of conditioning that they provide to your leather seats is minimal. The wipes will protect your leathers against some ultraviolet exposure, but not much else. You could compensate by wiping more frequently, but if you use these wipes, you should probably pre-clean your seats with a damp sponge before applying them. You should also purchase a separate conditioner to use after the cleaning process and ensure that it is compatible with the chemical treatment left by the wipes. The Meguiar’s G10916 Gold Class Rich Leather Cleaner & Conditioner is a rich leather conditioner which is super effective at preserving your car seats, provided that it doesn’t discolor them. The Meguiar’s leather cleaner and conditioner is a powerful spray-on product which has the potential to be the only thing you’ll need to keep your leathers in good shape. The chemical penetrates into leather, removes the dirt, and prevents fading via its conditioning elements. Your leather will be nourished and regenerated, and you won’t need to worry about any greasy buildup if you overdo it. On the other hand, the Meguiar cleaner has the potential to change the color of your leathers. Like many other high-end leather conditioners, this product emphasizes power rather than keeping the leather in its original color. While many of these high-end conditioners turn the leathers darker when applied, it’s impossible to tell what this conditioner will do until you try it out on a small portion of your car’s leather that is out of sight. If you are satisfied with the coloration, you can apply it everywhere else. Be aware that the color change is almost certainly permanent, and will probably be a shade darker than the leather was originally. This means that your leathers can be exposed to additional sunlight or other bleaching influences and still look good. You should clean and condition your leather once every few months if you leave your car in the sun. If you regularly leave your car in dusty and hot areas, you may want to consider conditioning your leather every month or so. It all depends on how much stress you are causing to your leathers. If your car leathers are not exposed to the sun, you probably can get away with cleaning them less frequently. Remember, cleaning and conditioning your car seat leathers too frequently can cause them to become dehydrated and damaged. If your leathers have been recently cleaned and they don’t look dirty, it is better to let them lie. You can find references for what leather looks like when it needs help on the internet — it’s best to find a swatch of the same kind of leather as your car seats have for comparison’s sake. If you see any signs of cracking or discoloration, you’re overdue for a conditioning. The most persistent hazard which will damage your leathers is the sun. Ultraviolet rays will give your leathers a sunburn because leathers are merely animal skins. They will cause discoloration, dryness, and cracking. The problem with the sun is that it is going to affect your leather constantly. Other hazards like dust, oils, or chemicals are simply much less common. They’re also easier to prevent in the first place by being careful around your leathers. Your car seat leathers are always going to be vulnerable to mistreatment. The best way to avoid damaging them with a treatment is to test the treatment on a small portion of the leather that is out of sight. Then, you can see the impact of a particular cleaning regimen on your leathers. If you set aside a certain area that is out of sight as your tester area, you can also use it to figure out whether the rest of the leather is ready to get another round of conditioning or not. Most of all, don’t overdo it with any cleaning routines. Your leather does not need to be cleaned that often, and every clean that is effective at removing dirt or mildew is a clean that is dehydrating the leather. The same goes for conditioning routines. Your leather has a maximum point of moisture saturation. Beyond this point, you’re merely making a mess and potentially providing a nutrition source for microbes in your car.